A new virus is doing the rounds. 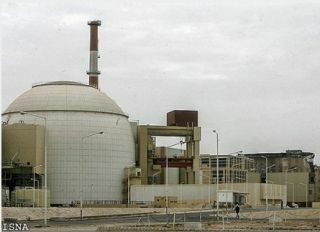 It's very dangerous, but possibly only if you happen to be in the vicinity of Iran's Bushehr nuclear power facility. The Stuxnet virus is believed to have been specifically designed to infect and ruin the computer systems of Iran, and possibly just its nuclear power plant - with several months of reverse engineering revealing a complex piece of viral code able to precisely attack one specific system. The usual doom-mongering security experts are already on the case, suggesting this new form of "weaponised software" could lead to a future where bespoke virus attacks designed to take out specific targets are created on the whims of potential super-villains. The Stuxnet virus is said to have infected 45,000 computer systems worldwide, but is yet to actually attack or cause any damage - because it hasn't found its predetermined target. Yet. It might be your emails it's really after. "Mum, Dad, I'm... a notorious international hacker"
The 17 year old who created this week's insane "mouseover" glitch in the Twitter matrix is yet to tell his parents about the trouble he caused around the world. Pearce Delphin, who calls himself Zzap on Twitter, was the first to post the mouseover code that was hijacked by other users and eventually brought Twitter to its knees. The Aussie kid, speaking to the Downunder Telegraph, said he did it "to see if it could be done" and didn't foresee the several hours of mild inconvenience he would cause to bored office workers the world over. The University of Toronto's Snowbird has finally made the human-powered flight dream real. Instead of wearing a feather suit and jumping off the end of a pier, Snowbird takes a pedal-powered approach to flight, with the ornithopter taking to the skies. Or whatever the bit of air ten feet above the ground is called. Sky is perhaps too flattering a word. It flew for 19.3 seconds and covered 145 metres, although it does appear to have been towed up into the air. Pilot Todd Reichert is believed to have had the chicken meal option, and watched the first 18 seconds of Jackie Chan's remake of The Karate Kid. Prank App Store app Scary Phone claimed a proper victim this week, terrifying an American girl so much she climbed out of a window and ran to a neighbour's house for help. AND STAY OUT:"Now walk slowly backwards through the cellar"
The app creates a fake phone call that warns the listener to "Get out now" - which the girl did very quickly after phoning her mum in a panic, thanks to the app making it appear that the phone call was coming from her own landline number. To be fair, the App Store description warns that the app may cause heart attacks.